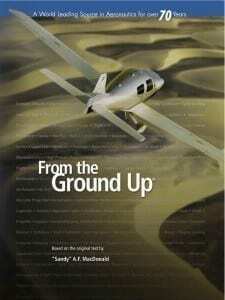 For 70 years, the content of From The Ground Up has stood as a literary benchmark for the teaching of the multitude of components and complexities inherent in the challenging activity of flight learning and education. Through its evolving editions, many generations of readers have been challenged by the concepts and theories that require thorough understanding in advance of the sought-after hours of flying enjoyment that are the ultimate goal of all who seek to earn their wings and expand their knowledge of flight theory and practice. The content of From The Ground Up may, at times, seem adverse and complex but the path to understanding the fundamentals of flight is one that reaps much in the way of personal reward for all those who maintain the course. Indeed, it was by design that its original author, Sandy A. F. MacDonald a man recognized as a father of what still stands today as the standard curriculum for ground school instruction devised this training manual to be comprehensive and current while conveying its material in such a way as to enhance the readers understanding of the written word. Not one to permit his vast experience to allow for foregone conclusions, his meticulous care in the creation of From The Ground Up has became the hallmark for its wide-spread use and respect as the reference manual of choice in hundreds of flying schools throughout Canada and around the world. Its latest editions are the 29th Millennium Edition in Canada, and the U.S. Edition in the United States. (A French-language version is also available under the title Entre Ciel et Terre.) Totalling 356 pages of in-depth two-column text formatted in a sequential, logical and easy-to-read fashion, the publication boasts over 360 graphics, charts, diagrams and photos, with additional full-colour navigation charts and sample weather charts included. All chapters are current in the latest technological and legislative aeronautical matters and cover such topics as The Airplane, Theory of Flight, Aero Engines, Aeronautical Rules & Procedures, Aviation Weather, Navigation, Radio & Radio Navigation, Airmanship, Human Factors, and Air Safety. From The Ground Up also includes an extensive index, glossary and practice examination. Updated regularly, From The Ground Up has long been considered an essential resource for all with any interest whatsoever in aeronautics, aviation, and flying..